The City of Joliet, considered to be Illinois’s fastest growing city, recently underwent a major upgrade to its aging collection system infrastructure. 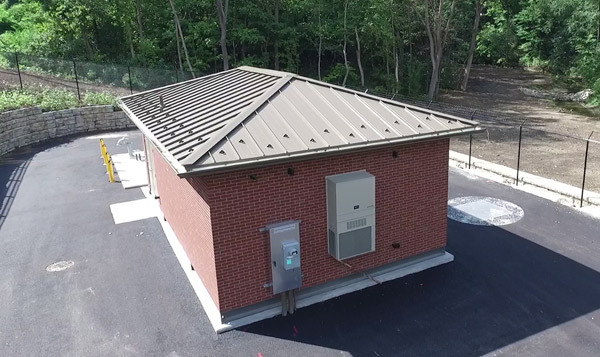 In conjunction with General Contractor, Joseph J. Henderson and Engineer, Baxter & Woodman, Metropolitan Industries supplied the City of Joliet with a Sanitary Lift Station to upgrade the existing service to residences and businesses on the West side of Joliet. 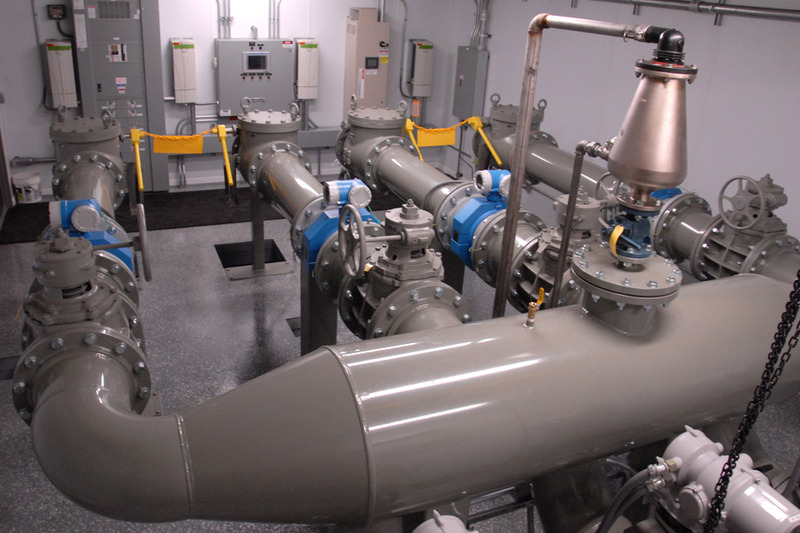 The prefabricated housed system replaced the original infrastructure with a new prefabricated valve station and control house designed to handle flow from a new four pump lift station. A maximum of three pumps are expected to run while the fourth pump acts as a backup in the event that one pump is out of service. Heavy flows come in at the West Park site in Joliet so it was important to have a fourth pump installed. There was tremendous effort that went into completing the nearly 20’ wide by 32’ long building. The building is fully customized to fit the specifications from the City of Joliet Public Works Department. Metropolitan Industries supplied the building and the 12” discharge piping inside including connection to three existing force mains through a 24” header assembly and electrically-actuated plug valves to direct the flow. Also updated were the valves and flow metering, which are now above ground, eliminating the need for confined space entry. The off-load process was unique because the building had to be off loaded at the street and reach the entire distance to the new station site. Proper communication between these systems and Public Works employees is a major element in assuring all pumps and controls throughout the city are working properly. To give the City of Joliet “peace of mind” until the city’s SCADA communication system is upgraded and installed, Metropolitan also installed MetroMail, an alarm and messaging system. The temporary communication system was installed within one day and by the afternoon the owner was receiving text messages. “It was a bonus to have the manufacturer (Metropolitan) local as well,” Bjerning added. Jim Snell, engineer at Baxter & Woodman agreed that getting the seven pipes to line up smoothly was the biggest challenge. Snell also added that keeping the old lift station live while the project was going on was a major challenge that ended in success. The problem sometimes facing owners and engineers is a lack of usable indoor space at facilities. One of the only practical options available is to house the valves, meters and controls together in a massive house-like facility and ultimately mount the housed system outside. Other considerations that are taken into account is for the facility to be able to handle the region’s harsh winter environment. The housed control/valve structure was completely manufactured at Metropolitan and then delivered to its site location, where the roof was installed. Prefabricating the system in-house provides the added benefit of having a controlled environment during the manufacturing process and allowing delivery on time and on budget. Prefabricating a system such as buildings like this benefits the customer by eliminating the headaches involving scheduling, logistics and varying site conditions. The combination of all of the strengths from the parties involved is evidenced by our ability to help customers visualize finished products. Our knowledge and experience in pumping and mechanical equipment joined with our engineering and fabrication capabilities allow us to manufacture complete housed systems. We use state-of-the-art control technologies to create custom solutions best suited to fit the applications of our customers. Throughout design and manufacturing, we utilize the latest technologies and highest quality components with the goal of providing a reliable and long lasting system. All steps of the fabrication process are conducted and tested at our manufacturing facility.